Not only was Frank Sinatra among the biggest-selling recording artists of all time (150 million records at least), but he was also an actor of considerable skill and ability. Tremedously likeable, a whole generation of men around the world patterned themselves after Sinatra and his "Rat Pack." Born to Italian immigrant parents in Hoboken, New Jersey, Sinatra started out singing on the Major Bowes Amateur Hour show in 1935. After getting a gig at a New Jersey roadhouse with a radio pickup, Sinatra got the attention of bandleader Harry James, for whom Sinatra worked until 1940. Then, with the Tommy Dorsey Band, Sinatra toured and recorded extensively. Signing on as a solo performer with Columbia Records in 1943, Sinatra began appearing in films. After a couple of uncredited bit parts, Sinatra made his debut in Reveille with Beverly (released in February, 1943), with Ann Miller. Classified as 4-F due to a perforrated eardrum he was born with, Sinatra did not serve in the military during World War II. Toward the end of the War, he toured the Europian Theatre with comedian Phil Silvers in USO shows. M-G-M producer Joe Pasternack signed Sinatra on to his musical picture Anchors Aweigh (released in August, 1945), with Gene Kelly, and it was a major success. Anxious to get Sinatra in another film, he sang a song at the end of their biopic of composer Jerome Kern, Till the Clouds Roll By (released in December, 1946), and it too, was a success. With its on location filming, jazzy Leonard Bernstein score and with Gene Kelly both starring, co-directing and doing the choreography, On the Town (released in December, 1949), became a whopping hit, making Sinatra a rising star. A couple of dud films put Sinatra behind the 8-ball, however. Having additional trouble due to his divorce from his first wife and marrying Ava Gardner, Sinatra had turned to performing in Las Vegas at the Desert Inn and spending much of his time there. Columbia Records dropped him in 1952. He lobbied relentlessly to get the role of "Maggio," in the film version of James Jones novel From Here to Eternity (released in August, 1953), with Deborah Kerr and Burt Lancaster. The film was a whopping success, with Sinatra winning the Best Supporting Actor Oscar for his performance as a doomed Army Private, catapulted him back to the front ranks of entertainers. Sinatra understood the word synergy. Signing with Capitol Records, and popular with Hollywood again, Sinatra embarked on an incredible whilwind of activity; just look at these films released in 1955: Not as a Stranger (released in July), with Olivia de Havilland, Guys and Dolls (released in November), with Marlon Brando and Jean Simmons, The Tender Trap (released in November), with Debbie Reynolds, AND The Man with the Golden Arm (released in December), with Kim Novak. Large and In Charge, Sinatra left Capitol Records in 1960 in order to set up his own record label, Reprise Records. While at the Sands in Las Vegas, Sinatra personally developed and paid for Ocean's 11 (released in August, 1960), with Dean Martin, and Sammy Davis Jr. The film was such a success that Warner Bros. (after purchasing a controlling interest in Reprise Records) put the whole Rat Pack in Sergeants 3 (released in February, 1962). Another signature role for Ol' Blue Eyes is The Manchurian Candidate (released in October, 1962), with Laurence Harvey, which is chillingly relevent today. 4 for Texas (released in December, 1963), with Dean Martin, was a passible western, while Robin and the 7 Hoods (released in June, 1964), with Dean, Sammy and Bing, is entertaining but terribly dated now. Sinatra starred in and directed None But the Brave (released in Febuary, 1965), then did the footprinting thing at the Chinese before the opening of the action picture Von Ryan's Express (which played the Chinese in July, 1965), with Trevor Howard, Sinatra took a supoporting role in Cast a Giant Shadow (which played the Chinese in May, 1966), with Kirk Douglas. 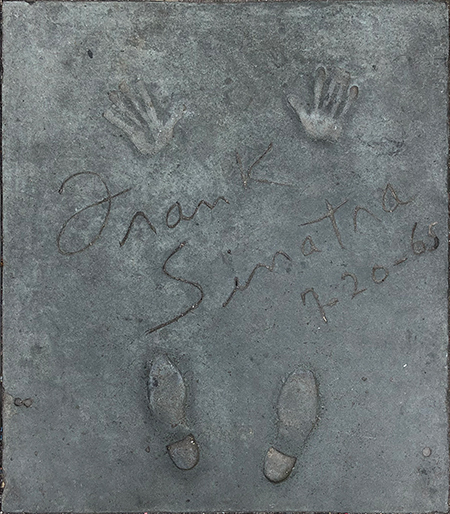 Sinatra did not connect with any of the "new Hollywood" directors and settle for playing in a series of detective films: Tony Rome (released in November, 1967), with Jill St. John, The Detective (released in May, 1968), with Lee Remick, and Lady in Cement (which played the Chinese in November, 1968), with Raquel Welch. In Dirty Dingus Magee (released in November, 1970), with George Kennedy, Sinatra was accused of not caring about his film work, having his supporting players do all the work for him. He "retired" in 1970, but by 1973, he was back in action, busier than ever, recording, perfoming, and doing television specials. He gave a better account of himself as a troubled detective in The First Deadly Sin (released in October, 1980), with Faye Dunaway, and years later, did a walk-on in Cannonball Run II (released in June, 1984), His final appearance was as a guest star on an episode of Magnum, P.I. aired over CBS, in February, 1987). After the airing of the Magnum, P.I. 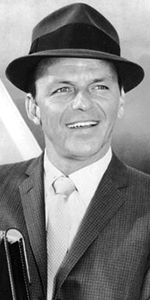 episode, Sinatra suffered a heart attack and made no further public appearances. In increasingly poor health, Sinatra hung on until suffering a fatl heart attack in May of 1998 at the age of 82. Grauman's Chinese Theatre, Hollywood, California. 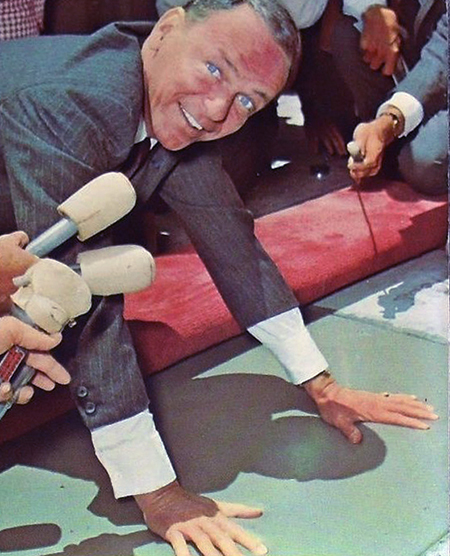 Frank Sinatra Forecourt ceremony, Tuesday, July 20, 1965. Ms. Reynolds strikes a pose for the many photographers gathered to record the event.